Step 1 In a food processor, (or if you don’t have one, a medium sized bowl with a whisk) process all ingredients until smooth. Portion out into snack-size zip top bags. 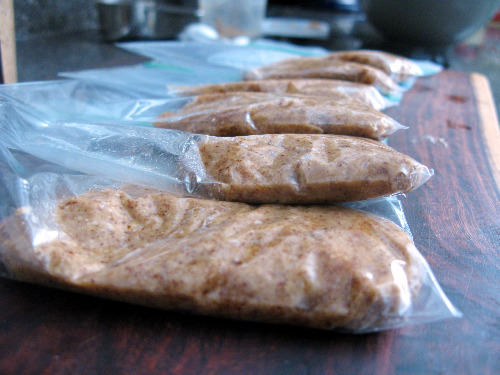 I portioned 2 ounces of maple almond butter per bag and ended up needing 6 bags. To eat, cut the tip off one of the sides of the bag… and squeeze into yo mouth! We don’t know who you are but your nut butters are delicious. However, we keep bulk almond butter on hand at all times and use it in many ways. It appeared prudent to us to use this bulk butter to create a squeezable nut-dulgence of our own. We must give credit where credit is due…you inspired us. That said, we regret to inform you that we have cracked the code to your Maple Almond Butter and will not be purchasing yours with the same frequency as before. While we do not believe that this will damage your business beyond repair we felt it was right to let you know. Good luck to you and may your convenient and adorable packages still lead you to success despite this temporary setback.